Scar is 78 years old, in dog years. His real name is Harley, but when we man it up in the woods, he answers only to Scar. He held up well yesterday when we spent the day looking for mushrooms. He didn’t scamper and explore and rub in dead animals like he used to, but he kept pace, a distance behind, and we got half a bucket of dry, white Chanterelles. At the end of the day, still in the woods, just the two of us, I pulled out a sandwich, gave him some, and we just sat there for awhile. I put my hearing aid to setting 4, which magnifies the wind. We were on top of our hill, where Lobster mushrooms appear later in the season, and a hundred yards from where Matsutake tend to pop up on election years, right after the frost. We were just above the bank where we both got stung by bees two years ago, and right below the wild huckleberry bramble where Bill’s flannel shirt has been sitting on a log for 10 years. This might not be accurate, but I think Scar gave me a knowing ‘nod’, as if to say, “This has been an awesome day, I mean really awesome, and, it might be the last time we do this together.” Sure enough, when we finally stood up, we both felt the aches in our joints, but Scar more than me, and I can’t ignore it. It won’t be the same without him. When he tagged along the first time, Bill was wearing that flannel shirt. I remember it was hot that day. This has been an active summer. While resting up from calling 35 auctions (over the year), I began doing Innovation Workshops at Amazon, and shot a short film with Bret Fetzer, called Haw Hee, about a young man who goes to great lengths to become famous (the story was part of Beyond Kindness.) I worked with Lynn Shelton and Cherdonna Shinatra on an experimental short film called Power, and did a reading with my old friend Nikki Louis. George Greene, founder, and Dan Kennedy, host of The Moth, staged one on Bainbridge Island, and I told a story about Father McGoldrick saying the block rosary at our house in 1972. I really hope they air it. I’ll let you know if they do. To close the summer out, on Sept. 5, my mother, Bettie Smith, turned 95, and we had a bash at Magnussen Park. 74 people, mostly relatives with a few old and new neighbors. It wasn’t hot, so there was no swimming, but it didn’t rain either. The cake was terrific, and we ate the extra food for a week. The secret code, to let me know that you read this far is flannel shirt. Thank you! Want to do/learn some Improv? 8-week class @ Freehold…Basic Improv…for anyone. This will be Freehold’s last class @ 2nd & Bell, before they move to China Town. 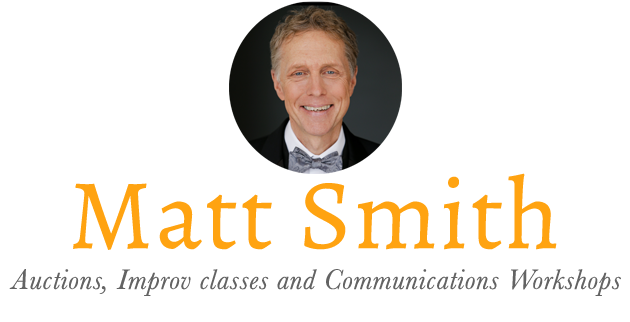 This class covers all the fundamentals of Improvisational theatre. Try it. Really. Starting October 3. That’s soon! In this foundation class you’ll learn guidelines and boundaries that actually set you free. Break down that which dictates your habits, and build a system within which you can move. Lots of fun too. Hello writers, storytellers, teachers, actors, or “others” reaching for scintillating material… interested weaving narratives that’ll make your audience lean in and take notice? Feeling blocked? Then take this narrative-focused class and jump into exercises that’ll uncover good, sticky narrative where it hides. Not just for writers. This is a handful of exercises that engage the memory, and it’s a blast. They open up access to forgotten moments, old acquaintances, cool imagery, and crazy/serious/sweet parts of your life. No Improv or writing experience is required, but it’s great for storytellers! That’s about it for me. I saw Opie’s Beatle Documentary. Twice. The best part was being in a deep state of mesmerization with my wife and a theatre full of people, mostly around my age, who had the same profound connection to every word, every anecdote, every note. Some were singing along, as if it were a retirement home gathering. (Well…..) Aftewards, I could have drummed up a meaningful conversation with any one of them. Posted in Uncategorized and tagged auctions, classes, improv.